The 2012 World Series of Poker Event #10 Seven Card Stud started with 145 players three days ago, and now only one remains. Day 3 began with 16 players, including some of the game’s best, but after ten and a half hours of play it was mixed-games specialist John Monnette who emerged victorious to capture the $190,826 first-place prize and his second WSOP gold bracelet. The day began with an early elimination when Mark Dickstein dispatched a short-stacked Nick Schulman in 16th place, for which he earned $12,035. Not long after, a hand developed that saw Bryn Kenney bring it in with the , Huu Vinh complete and Perry Friedman call. Mike Sexton then sprung to life with a raise, Kenney folded and both Vinh and Friedman called. The turn saw Sexton led out with a bet, both his opponents called, and then he committed his last 10,000 on fifth street. Again Vinh and Friedman called before the former fired out a bet on sixth and drove out the latter. Sexton got it in with kings but fell behind when Vinh made two pair on sixth. Sexton was drawing live on seventh, but the blanked and he was eliminated in 15th place for $12,035. 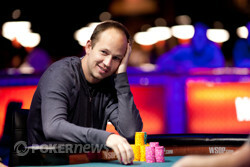 Sexton also finished in 15th place in Event #4 $1,500 Seven Card Stud Hi-Low 8-or-Better earlier in the series. Over the next two hours, six more players hit the rail to bring about the official final table. It didn’t take long for the first elimination of the final table to occur as a series of raises saw short-stacked Raymond Dehkharghani all in on third against Tim Finne. Dehkharghani's sevens were in the lead when the money went in, but he feel behind when Finne paired his queen on the turn. Neither fifth nor sixth streets were overly exciting, but seventh, which gave Finne two pair, left Dehkharghani in need of the case seven on the river to survive. He squeezed it out and it was four-across and a club, but it turned out to be the useless . With that, Dehkharghani exited in eighth place for $22,332. It took awhile for the next elimination but it happened in Level 23 when Kenney, who finished as the chip leader on Day 1 of this event, completed with the and Vinh called along showing the . Vinh's jacks up were plenty good, and he's sent Kenney off in seventh place, good for a $27,062 consolation prize. 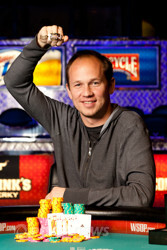 Minutes later Dickstein would hit the rail in sixth place after Monnette made a flush on seventh. Minutes later, after action was brought in, a short-stacked Jeff Lisandro completed and received a call from Friedman. The 2009 WSOP Player of the Year then led out on the turn only to call off when Friedman raised. Lisandro was ahead with nines when the money went in, but he needed to dodge Friedman's gut-shot straight draw, which became a double-gutted straight draw on fifth street. Sixth gave Friedman more outs, but it was the on seventh that would give him the straight and send the five-time bracelet winner to the rail. Lisandro misses out on his sixth bracelet, which would have been his fifth in Stud variations, but he left with a $41,789 consolation prize for his fifth-place finish. From there, Friedman grew short stacked and completed a hand only to have Monnette put in a raise. Friedman committed himself with a three-bet and Monnette made the call. Neither player held a pair when the money went in, and it'd take until sixth street before one was made. Unfortunately for Friedman, it was Monnette who made sevens to take the lead. Seventh street provided no surprises and Friedman took his leave in fourth place to a nice round of applause. Three-handed play was an extended affair, but eventually the limits caught up with the players. While both Vinh and Finne both dwindled, Monnette increased his stack in steady fashion. Eventually Monnette brought it in with the , Finne completed and Vinh raised. Monnette got out of the way while Finne made the call, leaving himself just 28,000 behind. 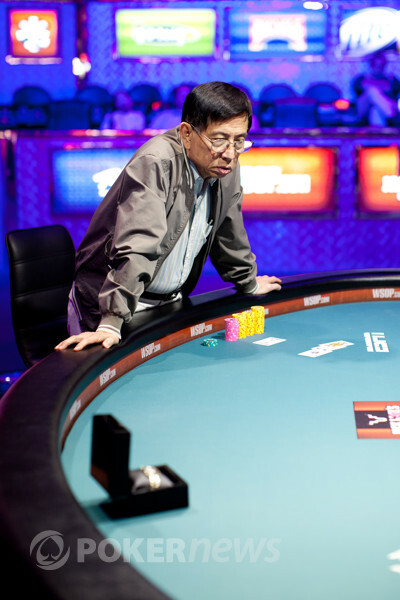 The turn saw Finne commit his stack, and after a moment's hesitation, Vinh made the call. Finne needed some help, and while fifth and sixth streets gave him outs to a flush and straight, seventh missed him completely. Finne shook hands with his opponents before heading to the payout desk to collect $73,847. From there, Monnette took a 6-1 chip lead into heads-up play and never looked back. It took about 20 more minutes, but eventually Vinh succumbed. Interestingly, a pair of jacks, which Monnette made on the last hand to clinch victory, was the hand that he had when he won his first bracelet a year earlier. Congratulations to John Monnette for becoming the 2012 WSOP Event #10 $5,000 Seven Card Stud Champion and capturing his second gold bracelet! That does it for our coverage from Event #10, but there is still plenty of action to be had. Be sure to visit our Live Reporting Page to see what events are taking place right now. Huu Vinh had the bring in with the and spiked his entire stack of approximately 100,000, signaling that he was committing himself. Monnette still need to oblige and did with a raise, meaning Vinh automatically reraised his last few chips. "Get lucky," Vinh said in reference to his situation. Unfortunately for Vinh, it wasn't in the cards as Monnette paired jacks and he failed to materialize much of anything. 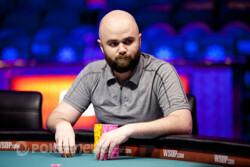 Huu, who finished fifth in the $1,500 Seven Card Stud event less than a week ago, will take home $117,913 and the satisfaction of knowing that he is a two-time Stud final tablist here at the 2012 WSOP. Interestingly, a pair of jacks is the hand that won Monnette his first bracelet last year. John Monnette brought in with the , then called a completion from Huu Vinh's . On fourth, Monnette made an open pair with the , and he made the small bet of 30,000. Vinh pulled the and needed some time in the tank. He stood from his chair — as we're used to seeing him do — and rested his palms on the rail as he studied the situation. He counted down his remaining stack to find it dangerously thin at just 180,000 chips. Three big bets left. Vinh looked at his watch and mumbled something that we couldn't understand. It amused him, though, and we did hear him say, "Not sure I can win with this," as he looked down at his chips. Eventually, he raised to 90,000, and that was just what he needed to do. Monnette mucked his hand, and Vinh celebrated his correct decision as he tries to climb back in this match. After John Monnette brought it in with the , Tim Finne completed and Huu Vinh raised. Monnette got out of the way while Finne made the call, leaving himself just 28,000 behind. 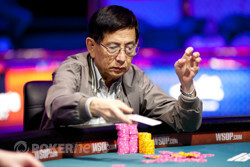 The turn saw Finne commit his stack, and after a moment's hesitation, Vinh made the call. Tim Finne brought in with the then called the completion from John Monnette and his . Finne would find himself in a bad spot as this hand played out. Monnette went ahead and barreled through sixth street with Finne calling through fifth. But that sixth card paired Monnette's door card, and his bet sent Finne for another long soak in the tank. He only had 135,000 chips left in front of him, so to call on sixth would likely mean committing another 50,000 on seventh. After another few minutes of deliberation, a frustrated Finned tucked and mucked. On the next hand, Monnette was the bring-in with the . Huu Vinh completed with the , but Monnette instantly stacked out 60,000 into the pot. Vinh let out a noise of disgust and a shake of the head. "Take it," he instructed as he returned his cards to the dealer. Things are awfully lopsided right now, and the odds are stacked well against the two shorties. Monnette sure knows his way around a stud table. John Monnette brought it in with the and then raised when Huu Vinh completed with the . Not to be deterred, Vinh three-bet and Monnette called. The turn saw Monnette call a bet from Vinh, while fifth street elicited the opposite reaction. Ship the small pot to Vinh. Someone just walked past our final table and noticed what was going on. Whoever it was, it's a John Monnette fan. "Get 'em, Monnette. Get 'em!" he yelled. More and more often now, Monnette is letting a tiny smile cross his face. But just for a fleeting instant. Then it's back to business. John Monnette wins Event #10!